Sadly work and study commitments have meant that I made less swift progress on the 2 teams as previously, but progress has been made so time for another blog. 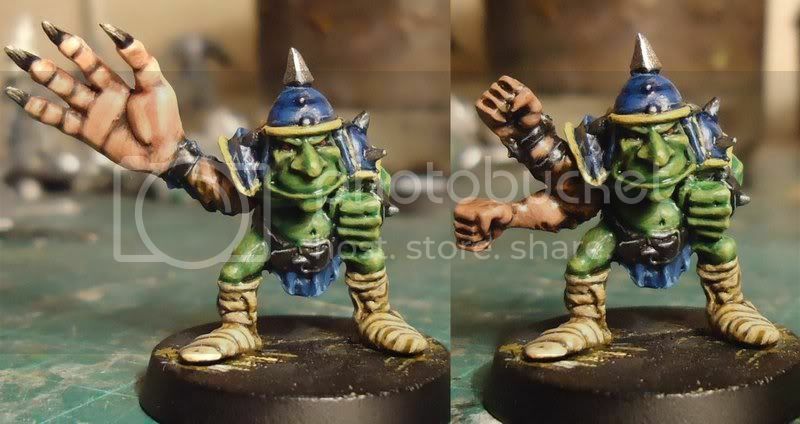 I have finished the 2 mutated goblins with interchangeable arms/heads so it is just the troll and bases to be completed. 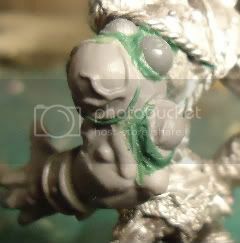 Some progress has been made on the troll, I've drilled out his eye socket to fit an eye from the Chaos spawn, this will be a chunk of warpstone. I've also added several chunks to his arm and started sculpting the flesh surrounding them, i'm debating whether to paint or sculpt the poisonous veins that will be running through his arm and face. I'm still trying to decide what colour to do him, am not sure if I should use green so he matches to gobbos, a more traditional blue or maybe a grey? I think I have finally got the design of the amazon linewomen sorted as well. 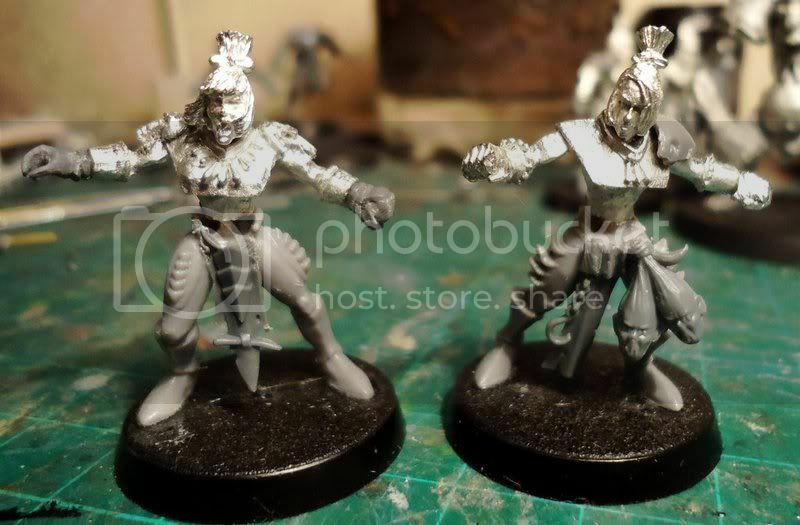 I'm trying to update them a bit so they have some "modern" BB type equipment (so shoulder pads, boots and sports type trousers) but still keep the savage jungle feel so loincloths, severed heads and some jewellery. They still need the gabs between their wrists and midriffs filled and I might sculpt some extra details too. 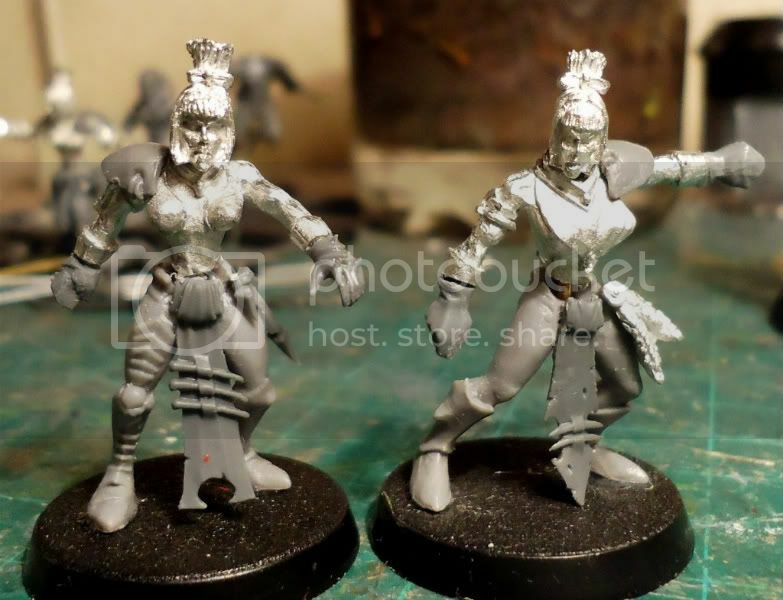 I already have the running legs to use for the Blitzers and am liking the idea of giving them facemasks as it means i can use some different heads, even male ones with sculpted long hair. For the catchers the legs of the dark elder scourges for really dynamic poses. The Throwers might get the generic pointing pose, but I do like the feathered headdresses for the heads. The idea is that it will be easy to tell the 4 positionals apart, which is an issue with the standard GW team. I still need to come up with designs for Zara, since she is sort of an Amazon I'm thinking making her a fancy version of the existing team but maybe with a bit more armour to represent AV8. Mind you using the awesome model of Lelith Hesperax as a conversion might be an idea too. Does anyone pay you to do this?! ?...cuz if they don't they should. If I may be so bold as to suggest a color for your troll... purple is a good complementary color to green. It would also lend itself to blue, green or gray highlights. Just a suggestion. Only one comment so far? 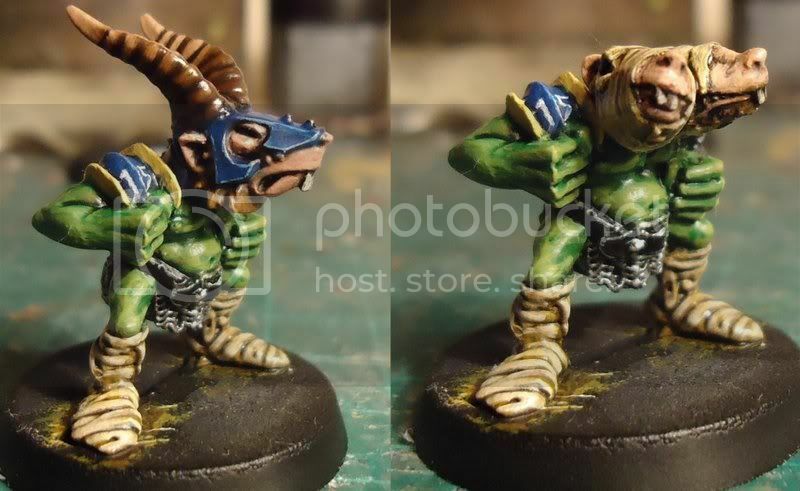 I really like second edition goblins and I really like your paintjob. Also the conversations are well executed. Nice! Only one thing you might improve on your next weapon snip: drill a little, not-so-deep hole in the fist? Right now it is very flat. Or give him a knuckleduster! Lelith fits Zara pretty well, I think. If I imagine her right, looking not so super-grim with brighter colours.